As Krispy Kreme prepares to celebrates its 80th anniversary, the doughnut chain will be selling a dozen doughnuts for 80 cents this week. Considering that a single doughnut normally sells at Krispy Kreme for 99 cents, the offer makes for a pretty good bargain. 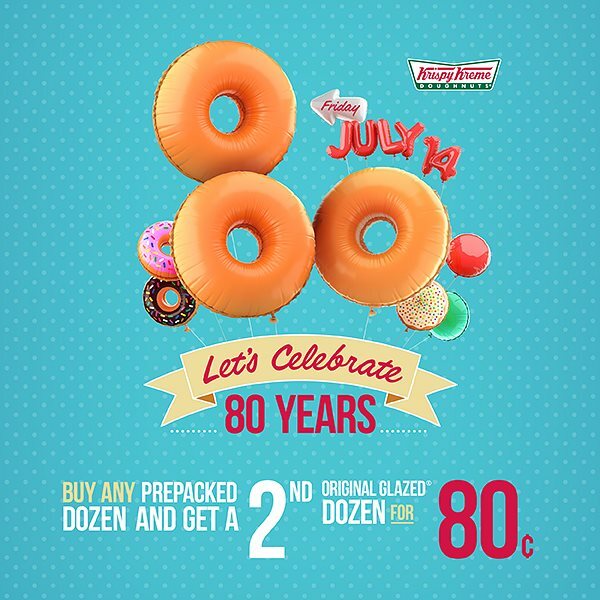 The deal runs only on Friday, July 14, and lasts all day, marking the 80th anniversary of the chain’s first doughnut shop opening on July 13, 1937 in Winston-Salem, N.C.
Customers won’t need to present a coupon or certificate to get the deal. All they need to do is show up to a participating Krispy Kreme in the United States or Canada. Some locations may not have the deal — to find out if a local Krispy Kreme will be offering the sale, customers can use the company’s store locator. Krispy Kreme is also bringing back its cake batter doughnut, which is filled with yellow cake batter and White Kreme filling with yellow icing and confetti sprinkles on top.